Ali Malito at MarketWatch kicked a hornet’s nest this week with her piece on how much money people in their 30s should have saved for retirement. The response from the majority of people who saw this headline was a combination of anger, exasperation, and disbelief. Young people have to deal with expensive housing, student loans, grad school, weddings, down payments, the prospect of having kids, maybe taking a flier on a new business or start-up, travel, and actually enjoying their youth while they can. Saving for retirement ends up way down the list at this stage in life. Most young people either can’t or won’t prioritize saving at a young age. By 30, you should have a decent chunk of change saved for your future self, experts say — in fact, ideally your account would look like a year’s worth of salary, according to Boston-based investment firm Fidelity Investments, so if you make $50,000 a year, you’d have $50,000 saved already. By 35, you should have twice your salary, the firm said. The median retirement savings for a worker in their 30s was $45,000, according to Transamerica Center for Retirement Studies, which looked at workers’ retirement accounts including employer-sponsored accounts and individual retirement accounts. Fidelity assumes you would need to start saving 15% of your income by age 25 to achieve this goal. I’ve seen many studies that suggest you need 20-25x your annual spending needs by retirement. This is a tall order for most people. Everyone assumes it would be impossible for people in their 30s to be this prepared for retirement but I wanted to run the numbers to see what it would take. Let’s assume a young person makes $40k straight out of college at age 22 and sees their income increase by 3% per year to account for standard of living increases and raises. 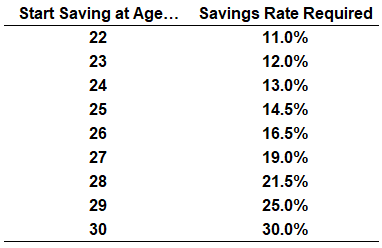 To save twice your salary by age 35 would require a constant 11% savings annual savings from age 22 on. Not all that bad. Obviously, no one’s life plays out this neatly. Your life is not a retirement calculator. Priorities evolve. Circumstances and responsibilities shift. Your job or income situation is sure to change. The point remains — the longer you wait, the more you’re going to have to play catch-up. In a perfect world, everyone would begin saving right when they start their first job (I would love it if every baby born in America got $1,000 invested in their name into the Vanguard Total Stock Market ETF that they couldn’t touch until retirement. Can you imagine the compounding benefits?!). A high savings rate combined with a low level of lifestyle creep is a personal finance superpower. The great thing about having a high savings rate is the fact that there isn’t nearly as much income to replace when you become financially independent. In combination with the ability to keep your lifestyle fairly consistent over time, this offers you a huge margin of safety. This is simple advice, but it’s very difficult to do in practice because there’s no equilibrium between delayed gratification and guilt-free spending. Start small. My savings example would require a 22-year-old to save $4,400 annually or $367 on a monthly basis. That’s tough for most young people. But isn’t it much more feasible to start out saving $50/month and add maybe $10 every other month to slowly build up to that amount? Not everyone can rip the cord and start out with a double-digit savings rate. A slow progression to get to that point can help. Systematize your $. Automation is your friend when dealing with your finances. The more you can take yourself and your emotions out of the equation and systematize your saving, spending, and bill payments the better. Willpower is fleeting so forcing yourself to save every month won’t work. You have to make it automatic. Take advantage of free money. I’m always amazed at the number of young people I talk to who aren’t contributing enough to receive their employer match in a workplace retirement plan. This is free money. Always save enough to at least earn the employer match if you’re lucky enough to have one. Whatever you do — do not compare your financial position to anyone else’s. Fear and greed are an investor’s biggest enemies but envy is your arch nemesis in personal finance. I’ve found the older I get the less and less I care what other people think about me (having kids really solidified this for me because I don’t have as much time to care about myself). Focus on your own finances and forget what everyone else is doing. Also remember that rules of thumb are imperfect. Nothing is written in stone. If your retirement portfolio doesn’t match up with the pretty pictures of people walking on a beach it’s not the end of the world. The great thing is you still have plenty of time if you’re in your 30s. You have many decades ahead of you to allow compounding to do the heavy lifting. Time is your greatest asset as a young person.